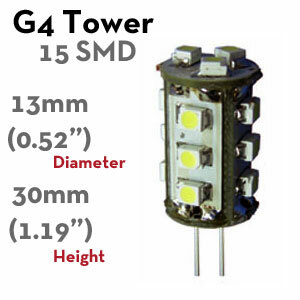 15 SMD G4 Bi-Pin, Tower-Style LED Bulb. 1.3 and 1.4 watt power usage for 89 Lumen Warm White LED and 165 Lumen Cool White LED. 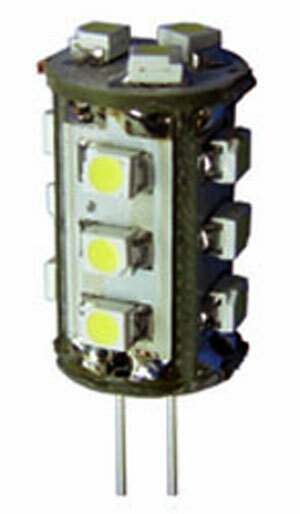 Low power, small size tower LED fits lower profile 10-30 volt DC lamps and fixtures. LED replacement bulb for home or boat, G4 tower style 12 volt LED. This LED is able to function on an input of 10-30 volts DC. May be used in side or back entry sockets - measure your space for fit.